Kelpie is parked in another free aire on the side of peaceful parkland outside the town of Rennes in France (48.11845, -1.59105). Arriving in Rennes – after dark of course as the winter days are so short – we drove through an industrial estate directed by our two satnavs, Sally the Chinese satnav (Dorry is still lagging behind in the directions and frequently takes herself off via the un-scenic route as and when she pleases). We’ve nicknamed her Dorry because she has the attention span of the fish in Finding Nemo. There were four other motorhomes already at the site, which is always encouraging. We parked between two – and settled in for the night. As usual seeing where we were actually parked would have to wait until daylight. As it turned out, the aire was positioned at the side of a beautiful river and lake. We went for a walk around to get our bearings. The peace and quiet is the thing that stood out most for me – people walking their dogs, lots and lots of runners and cyclists – all going about their daily business – but quietly. Strange to think that at the same time at home the marauding masses would be shoulder to shoulder, spending shed loads of money making Christmas “perfect”. To me this was perfect – complete silence – no sign of the commercial Christmas we know in the UK – just peace and quiet. We thought we might need to empty the grey water tank so drive over to the disposal area which was situated at the side of the site. Only when we reached the grid and Alan positioned the van over it did we discover that the grey water tap wasn’t where it should be – apparently we had been a bit enthusiastic over some speed bumps and had managed to dislodge the tap and lose it somewhere between Cherbourg and Rennes. With the grey tank already emptied along the journey through the tap-less hose, we realised we would need a replacement tap ASAP. So killing two birds with one stone we decided to get the bikes out and cycle down towards a shopping centre we’d spotted on the way in the night before. You won’t have heard me mention the bikes before now – that’s because I haven’t been on a bike for around 37 years – they say you never forget how to ride a bike – how hard can it be? Turns out it was a nightmare – I don’t remember it being this hard to stay upright, and steer, and watch for traffic, and look where I was going AND on the wrong side of the road! Alan cycled and I walked/pushed/rode my bike towards the shopping centre. Since I was out so of breath and cycling along the French equivalent of the M5, it wasn’t really much fun so we decided it might be best to park the bikes in the cycle park at the Carrefour supermarket and walk the rest of the 2km to Mr Bricolage to find a replacement tap. 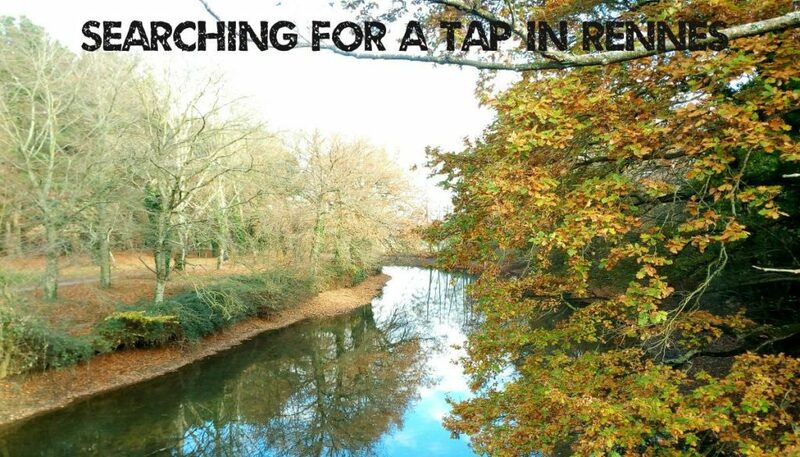 You’d think finding a tap fixture of some sort in a DIY shop would be a breeze – not so I’m afraid. We wandered up and down aisles before a young man took pity on us and directed us to the “stuff for people who have no idea what they’re looking for” aisle. Alan had remembered a post on Our Bumble where Craig had fitted an outside grey water tap on his motorhome using a ball valve tap. Alan spotted a similar style tap available in all different sizes and had to take a wild guess at which one would fit inside the drain hose. The one thing they didn’t have, can you believe in a hardware store, were jubilee clips – Alan even did a picture search on Google and showed it to the young man who did that shrugging shoulders thing indicating he had never set eyes on a jubilee clip before. We ended up getting a packet from, would you believe it – Carrefour supermarket. We walked back to Carrefour where Alan had earlier noticed the jubilee clips and collected the bikes, then walked/cycled our way back to the van. Alan was able to attach the new tap for the grey waste, inserting the threaded end covered in Sikaflex into the drain hose and securing it with the jubilee clip. Good as new – sure wasn’t that easy! The only issue was that the “nut” end of the tap was on the outside and our corrugated extension hose would not fit over it which we would need if we ended up somewhere that didn’t have a drive over drain. So Alan proceeded to dig through his tool box to find an array of files and gradually filed away the corners of the nut, rounding the connection until the extension hose fitted snugly over it. Alan has assured me that the new tap is much more rugged and robust than the “specially made for motorhomes” plastic version which costs 3 times the price of a metal ball valve and had lasted us for precisely 3 days before going AWOL. We got some stunning photos at sunset by the lake. Still not entirely convinced we are doing the right thing but its getting easier day by day – only time will tell.